Beautiful and rare early 19th century Louis XVl style bronze nine-light chandelier with Fine chasing. An unusual delicate and open construction with an atypical layout of arms features finely detailed swag chains and pulls. Three finely crafted acanthus leaf scroll arms and candle cups with later tole shades. 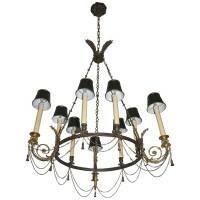 Height of chandelier to top of three acanthus leaves 37″ with chain and ceiling CAP 49″ and can be adjusted to suit. Diameter 37″.